A year ago I experienced a Sellnick mite infestation that ended up costing me nearly $300 in tests and my pig months of misery. Hopefully this will serve as a warning for others and keep them from making the same mistakes I did. Albie’s first sign was a change in his coat. His hair started to get that coarse, greasy-yet-dry feeling that human hair gets when it needs to be washed. He began to whine when I pet him, and he started to shed little clumps of hair attached to a flake of skin. He also had an excessive amount of ear wax. I took him to the vet, where he was subjected to a skin scrape and tested for yeast. The skin scrape came back negative—which I’ve since learned is not uncommon—and he tested positive for yeast. I was given a liquid called Nolvasan, which I was to dilute and spray onto his skin every day for a week. The Nolvasan had no effect, and Al’s symptoms became worse. He cried out whenever he was touched, he started to lose his hair, and his skin began to look red with a pale, flaky overlay. Repeated trips to the vet offered him no relief. At his worst, he had lost ¾ of his hair, he had numerous sores from biting himself, and his skin had lost that pale overlay and was extremely red, festered, and hot to the touch. When he first started having problems, I was told by several people that he had mites and to have the vet administer Ivermectin. I didn’t listen to them. I wanted to believe my vet, and I didn’t have the courage to disagree with him. Because of my inaction, Al was subjected to numerous skin scrapings, 2 blood draws under anesthesia, and a skin biopsy whereby he lost a plug of skin and received stitches. Also during this time, Al’s cagemate, St.John, was perfectly fine. I believed that if it Al did indeed have mites, then St.John would show signs of them, also. I’ve since learned that this is not true. One pig can be a carrier yet not exhibit any symptoms. Therefore if you only treat the pig that shows signs, he will immediately be re-infected by the pig that seems fine. I finally insisted that my vet give Al the Ivermectin, and the turnaround was almost immediate. 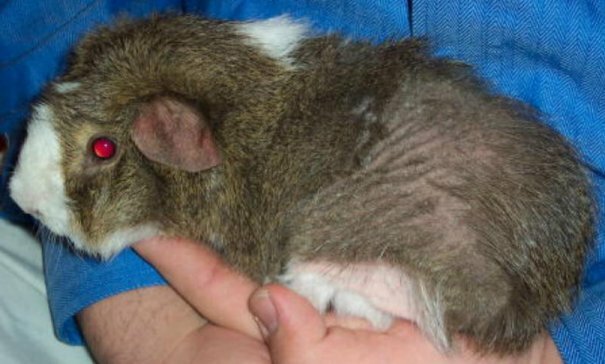 Within days his skin went back to a healthy pink and his sores started to heal. Yet still, my vet didn’t believe that Al was suffering from mites because the almighty skin scrapes were coming back negative. Important lesson here—don’t believe the skin scrapes. False negatives are all too common, which makes them unnecessary and only prolongs the pig’s pain. Because my vet refused a second dose of Ivermectin for Al and refused to dose St.John at all, I dosed them myself using the guidelines posted on GuineaLynx. In about a month, Al was completely healed. Just recently I noticed that both St.John’s and Al’s hair started to feel coarse and greasy/dry, and both seemed to be whinier than usual. I didn’t hesitate to dose them and my two new pigs with Ivermectin. After one dose, their hair softened up and their attitudes improved. I don’t doubt that I headed off another serious mite infestation. I learned two very important lessons from this experience. First, vets are not infallible—no matter how knowledgeable they seem. If several pig-owners are disagreeing with your vet, listen to them. Experience counts for much more than textbooks. Second, whenever you notice any signs of skin/hair abnormalities, give the pig the Ivermectin and ask questions later. When properly dosed, Ivermectin does not harm the pig and should therefore always be the first thing you try. You’ll save yourself some money and, more importantly, you’ll save the pig from unnecessary pain and stress. Attached are a couple pictures of Quintin when he had mites. 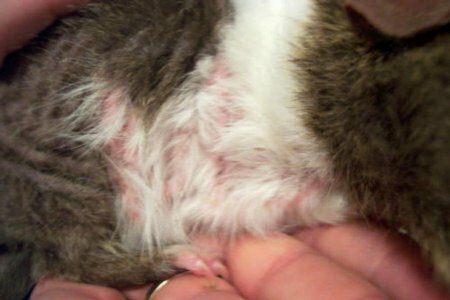 It started out with a few hairs coming off with some dry skin and progressed to this before he was treated with Ivermectin. He was brought to the vet when the bald spot was only about the size of a dime. I had mentioned mites and a skin scraping was taken. Showed up negative, so it was thought he was having an allergic reaction. The allergy medicine helped a bit with the itching but hair still kept falling out. I finally begged my vet to put him on Ivermec and within days you could see the difference. If these pics could be of any use, please feel free. I would hate for another to go through what Quintin and I did. Quintin has all his hair back now. A good ending to what could have been a horrible outcome.